Give your outdoor space an instant uplift with stylish garden and conservatory furniture from John Lewis. New furniture collections include everything from 2 and 3 seater sofas, lounge chairs, loveseats, coffee tables and stools. For smaller patios there are compact love seats with a handy table perfect for two people to relax and enjoy refreshments on. 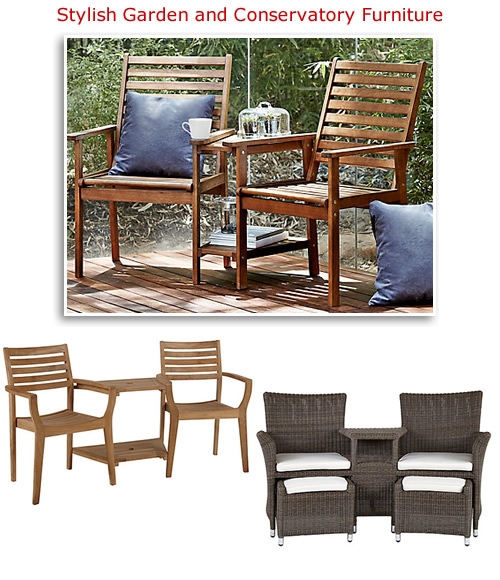 With long summer evenings to look forward what better way to prepare your garden than with comfortable weather resistant furniture. The Reims wicker love seat comes with matching stools and has a colonial style feel about it. The all-weather willow effect weave looks at home indoors as well as outdoors and works well in a conservatory, on the patio and also in the garden. Made from recycled man-made material, woven over a powder coated metal frame. A quality piece of furniture made to last against the elements. Easy to look after simply clean with a soft damp cloth. Dimensions H89 x W158 x D74cm. Complete with fabric cushion seat and pull out padded stools for extra comfort. A traditional looking garden duo seat in hardwood golden teak features a small table with space beneath. Plenty of room for placing your drinks, reading material and light snacks on. Teak in its natural state has a light golden colour this will gradually fade to silver grey. To keep its original colour it is advised to carefully sand the furniture at the start of the season. Dimensions H89 x W166 x D60cm. For a cheaper alternative with the same attractive features the Naples Outdoor Love Seats are a self assembly option. This wooden garden companion seat for two offers a pleasant retreat to enjoy those quiet moments on the patio. Soft cushions are available to buy separately. H96 x W15 x D60cm. You’ll find plenty of inspiration at John Lewis to give your garden a modern makeover where you can spend time relaxing and socialising with friends.